The spiral towards the bottom of the standings continues. Unfortunately, as the losses pile up, so do the injuries. Dwyane Wade was just getting into his game before colliding with a Buck defender and bruising his already sore right shoulder. This came after scoring 10 straight points for the Heat in the 3rd. 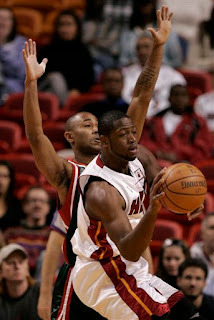 Without Wade for much of the 4th, the Heat didn't stand a chance and Milwaukee pulled away for a 103-98 win. Though he wasn't seriously injured in the collision, Dwyane nicked his hand a bit at the end. Mark Blount started tonight in place of the injured Shaquille O'Neal, and had a decent first half. Ricky Davis had a very nice game with 23 points, though unless he plays like this every game, expect him to be on his way out at some point in the not too distant future. Luke Jackson is god-awful. Somebody please send that guy back to Idaho. No offense to him, but he launched up several bricks and airballs when he would have been better off passing to a teammate to help create an actual open shot, not some prayer. I'd like to see Cook take over the offense when Wade is out or not on his game. It's clear the kid has confidence and ice water running in his veins. Let him loose. Free Eddie House? How about Free Daequan Cook. Luke Jackson should be giving all of his minutes to the rookie at this point. The problem is that this roster is so depleted, Riley is almost forced to let Jackson play. It's a sad day when Chris Quinn's return is refreshing and you prefer him in the lineup over Jason Williams. At this point it's pretty evident that JWill is going through the motions until the impending day when he is traded out of here. At least he will have a ring with him. I have to wonder how much more Wade can take of this losing. He didn't take his 4th shot until late into the 3rd quarter. Sometimes I want him to just take over and chuck 30 shots, but then he tries too hard and turns the ball over. Either way, we lose. My only request of him is to not burn himself out this year. Actually, scratch that. I want him to start working on that 3 point shot. He is often open for that shot and fakes it but then passes to a teammate. Just take it. If you can make a 20 footer consistently, you can make a 23 footer. He will never be the best player in the league if he is only taking 30 3s a season. Finally, tonight we faced two Bucks who were close to signing with the Heat this offseason. Mo Williams, who rejected Miami's offer in favor of a $20million richer offer from the Bucks, had a very nice game with 25 points and 9 assists. Rumors were he had been bragging about how he played the Heat and never took us seriously, though announcers tonight said he was heading here had the money been equal. Regardless, he would have looked real good on this team. Charlie Bell, who actually signed an offer sheet with us, unsurprisingly broke out of a recent slump against Miami. We seem to be the solution to everyone's problems.